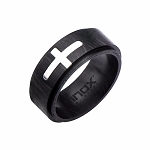 With its black carbon fiber insert, this designer men's stainless steel ring pairs classic contemporary design with au courant appeal. 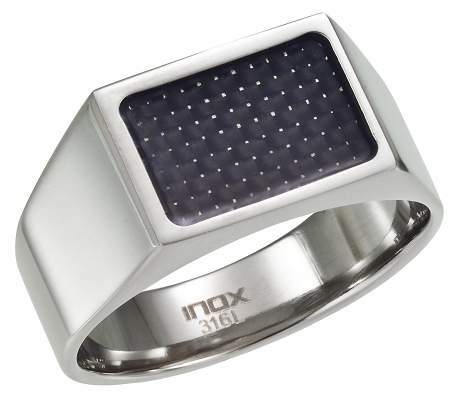 Made of high quality surgical stainless steel in a polished finish, this men's fashion ring pairs an eye-catching rectangular fiber centerpiece in an 8mm. I purchased this ring not only for the looks and price but to see what kind of workmanship justmensrings.com represent. I was not disappointed. I like the ring so much I went ahead and purchased their silver ring with a onyx stone. Nice quality merchandise. This ring is so beautiful. He has nothing like it. I was so happy it was available in size 14. Just want to say it looks just like the picture. It did take a little to get to me but now that I have it I like it. It's a little thin for a bigger man but it's still nice.